I've always resisted feeding wild creatures to support their natural behaviors and abilities to survive, but this week I made an exception. At times, I've seen hummingbirds levitate to my 4th floor windows, pausing for a second to look at me before darting off and up. Over time, I noticed their traffic patterns, passing rapidly by as if on a mission to somewhere else. Finally I discovered that they were frequenting my upstairs neighbor Nancy and her feeders. This past week, she kindly took hers down for repair so that the birds could learn mine. With only raw organic sugar in the pantry (not appropriate for little hummers), I made a special trip to the grocery store for a bag of C&H refined granules and cooked up my 1 part sugar to 4 parts water bird bevvy. On the first morning with my new feeders and homemade nectar there was a flurry of activity as they trekked by my windows on the way up to Nancy's and finding no food, retraced their steps past my balcony. They paused almost with surprise to see my red trimmed feeders, and then stopped by for a slurp. Within an hour, a regular stream of hummingbirds was flowing by for a taste. Territorial spats and chases took place all day until a pecking order seemed to form. One hummer had clearly won out, chastising and physically attacking others that approached the feeders. This little bully would sit on my railing and when hummers visited, he would chatter loudly and at times, dig his claws into their backs. On one occasion, he hooked them into a hungry victim so deeply that they both hit the window and then flew off stuck together in a seemingly painful grapple. So I now have a new resident hummer. This hyper control freak sits on my railing most of the day, head bobbing back and forth scanning the feeders and me, self-entitled to as much nectar as he desires, and constantly warning other birds to stay clear. He has achieved such a reputation for nastiness that all he has to do is twitch and "chee chee chee" when a bird flies by and typically they dart away. Those bold enough to ignore his warnings and attempt a taste receive the wrath of "Donald" (as was natural to call him) until they leave and he dive bombs after them. When I catch him harassing his innocent comrades, I scold him to "share! ", hoping that he will recognize that I am the true alpha bird of this balcony. But so far, King Donald continues to rule. He is amazingly tough and isn't spooked when I stick my face or camera right up to the window. On rainy days, he uses my feeder as a resting perch, almost nodding himself to sleep as if intoxicated after gorging himself on as much nectar as he can drink. Yesterday, I did some Googling and found out that Donald is an Anna's Hummingbird, found only on the west coast of North America. His body temperature soars above 100 and his inner furnace requires constant nutrients to stay stoked. During the cold days of winter, he can ease into a slumber state called "torpor" which halves his body temperature and enables him to cope. He will still come by to drink and feeders like mine will enable this immigrant from California to survive year round in our Seattle climate. Hummingbirds have long tongues for slurping. At times, Donald sticks his tongue out when resting, perhaps to taunt other birds and me! I also learned that Donald is a female. So I am training myself to call her Donna. When the sunlight catches her feathers, there is an amazing iridescence and in spite of her obnoxious personality, she is truly an intriguing and beautiful creature. There are a few friends and family that Donna permits on my balcony. One shy male comes by several times a day and Donna just gazes at him slurp as long as he chooses to. Hummingbirds do not mate for life but clearly Donna has an affinity for the lookers. The magenta gorget of this Anna's Hummingbird is stunning. At times, these feathers appear black but he can flash them at will. While some male hummingbirds have brilliance on their throats, this particular visitor wears a full psychedelic helmet. In spite of his bold appearance, he is extremely skittish, feeding feverishly and then zooming off when satisfied. As the chill of winter moves in, it will be interesting to see if Donna intensifies or tempers her "right wing" aggressiveness. 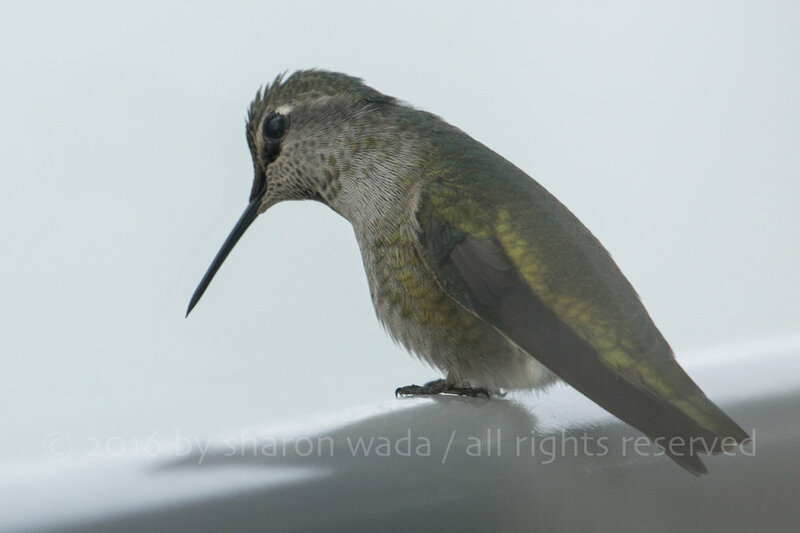 While I write this blog, she is out there on the railing in patrol position, seemingly very pleased with herself that she's in charge of these new pools of nectar; a hummingbird's mother lode. But I am hoping that with the days growing shorter and colder, she begins to behave less like a bully and more like a protector of fellow hummers trying to make the best of challenging times ahead.